With the exception of the DC & US Territories Quarters Silver Proof Set, silver coin sales were mostly lackluster based on the latest US Mint stats. The quarters silver proof set surged with an additional 12,238 sold for a total of 163,703. Not bad considering the sets have only been on sale since March 23. Why the increase? There’s a good chance the sets received extra attention when collectors were checking out the newly released 2009 Proof Set. Sales of Louis Braille Silver Dollars were on fire as reported last week. They have since cooled. 2,823 more were sold for a grand total of 168,564. That compares to the 10,045 additional sold during the previous reporting period. *Coin products with an asterisk are no longer available. 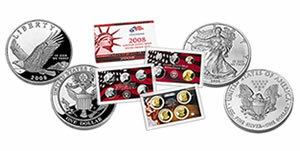 The previous reported sales figures are located at US Silver Coin Sales – May 28. As a reminder, Lincoln Silver Dollar figures remain unchanged. The maximum amount of individual coins have sold out, leaving 50,000 proof coins reserved for the special 5-coin set coming later this year. As yet another reminder, the collector 2009 silver eagles are still suspended. The Silver Coins Today tool page Mint Prices & Sales has been updated with the latest Mint sales figures. Visit the CoinNews collector tool page Mint Price Guide for tables of common collector gold and platinum coin stats, or First Spouse Coin Prices for coin stats of the First Ladies.